Welcome to Red Couch Recipes﻿! I am attending a church function tonight where we are invited to bring something that represents our Christmas traditions and a treat that we make for our families at Christmas. 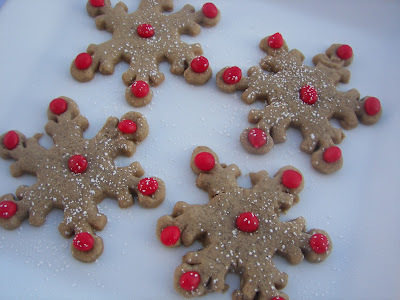 I am bringing these spiced snowflake cookies. Jacqueline's (Purple Chocolat Home) daughter Jessica, made them several years ago at a Family Christmas Party and I HAD to have the recipe. They are spicy and yummy and such a fun change-up from the traditional cut-out sugar cookie. Please don't forget to link up on Monday December 6, 13, and 20 in the month of December for my "It's Your Wonderful Life" party. There will be a few gifties. 1. In medium bowl, mix flour, cinnamon, ginger, cloves, salt and nutmeg; set aside. In large bowl, beat butter and brown sugar with electric mixer on medium speed until creamy. Beat in vanilla and eggs until fluffy. On Low speed, beat in flour mixture. 2. Divide dough in half; flatten each half into 1/4-inch thick rounds. Wrap dough rounds separately; refrigerate about 1 hour or until chilled. 3. Heat oven to 350 degrees. On floured cloth-covered work surface, roll half of dough at a time with floured rolling pin to 1/8-inch thickness. Cut with floured 2-to 3-inch snowflaked-shaped cookie cutter; place 1 inch apart on ungreased cookie sheets. 4. Bake 9 to 11 minutes or until edges are light golden brown. 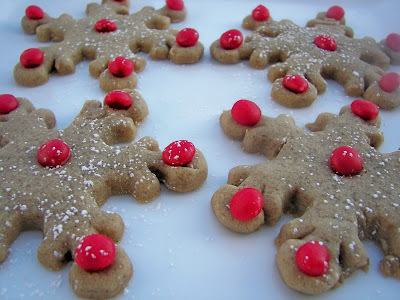 If you want to decorate cookies with cinnamon candies, place candies on cookies about 2 minutes before cookies are done. Remove from cookie sheets to cooling racks. If the cinnamon candies don't stick well, reapply them with a toothpick and white corn syrup. Enjoy these spicy Christmas delights. These are beautiful spice cookies. Awesome. Gorgeous cookies! Ginger/spicy cookies with cinnamon candies. Oh, yummy! And they are so pretty too. Two little boys would have a lot of fun placing the candies on the snowflakes! So pretty, I love the cinnamon hots. Thanks for sharing. These are so pretty and festive! I really love spice cookies...especially around the holidays! Those are beautiful cookies! Tis the season for these recipes! I just made a gingerbread loaf tonight with a vanilla glaze. You have always shared the most delicious sounding, and looking, recipes. I've been looking over some of the more recent ones and am sooooo hungry right now. These are so cute! You gave me the little boost I need to get into the holiday baking mood! I'm convinced that if we'd all bake cookies and share them...the world would be a better place! We'd all be in better moods for sure...have a great weekend! I love gingerbread with cinnamon candies and always put them on mine to. What a tasty combo! What a great idea to make them as snowflakes. Very pretty! Those are so pretty and look delicious also! The snowflakes look so beautiful with the red hots and the sprinkle of powdered sugar! Love them! These are so pretty! I'm sure they are yummy! Oh my, these look delicious and gorgeous! Your cookies are absolutely adorable. I am loving this idea, and definitely saving it. I might just have to make this for Christmas. These cookies look gorgeous and sound delicious. I'm sure they were a big hit at church! Love your candy spheres, too. So festive! These look so beautiful. Those cinnamon candies add just the right touch. Those look so yummy, and I bet the spice cookie and the red hots are great together! These are beautiful and sound so yummy...thanks for sharing!